The San Jose Blog: San Jose Stage Company Presents "An Iliad"
San Jose Stage Company Presents "An Iliad"
San Jose, CA – April 07, 2014 — San Jose Stage Company presents the captivating epic tale, An Iliad, adapted by Lisa Peterson and Denis O’Hare, opening April 9 and running through May 4. 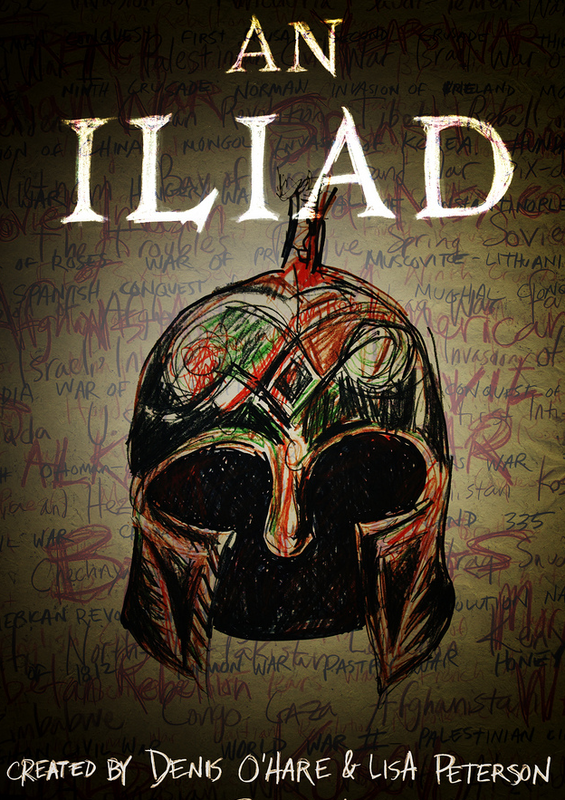 Based on Homer’s The Iliad and translated by Robert Fagles, An Iliad is a breathtaking and relevant, modern retelling of a timeless classic which unleashes the thrilling tales of the Trojan War and delves into the psychology of passion and rage, ancient and modern. In this tour-de-force, one actor plays the Greek classic's famous characters Achilles, Hector, Agamemnon, and ‘the face that launched a thousand ships’ Helen of Troy. From Mt. Olympus Gods such as Apollo, Athena and Hermes come and go. "Every time I sing this song, I hope it's the last time." So says ‘The Poet’ as he digs deep to sing Homer's epic story of war, honor, violence and the Greek siege of the city of Troy. He's told this story for centuries. It’s a good story,” says the lone figure, emerging from the darkness, as he launches into this modern, enthralling adaptation of Homer’s epic poem that relives the glory and brutality of the Trojan War. Now in the shadow of war in Iraq, Afghanistan and Syria, he unleashes the power of Homer’s classic poem for a modern audience. Bay Area favorite, Jackson Davis, plays ‘The Poet’ in this lean, muscular, tour-de-force performance he combines the majestic language of Homer with the informal way we speak today. As The Poet recites, comments and chats, he compels his audience to connect with his story, to feel what he feels, to believe in the importance of this story. Maybe if he tells the story one more time the violence will end. An Iliad premiered in 2010 and has been lauded by critics across the country, including The New York Times: "Mr. O'Hare and Ms. Peterson have telescoped the mighty expanses of Homer's great poem into an evening that scales the conflict of the Trojan War down to an intimate solo show illuminating both the heroism and the horror of warfare." Kenneth Kelleher directs the 100-minute performance. Mr. Kelleher has directed over twenty performances for The Stage, including The Threepenny Opera, the World Premiere of Jane Austen’s Persuasion, Red, Reckless, Buried Child, On The Waterfrontand Rock ‘n’ Roll. He is currently the Artistic Director of Pacific Repertory Theatre and Resident Director of The San Francisco Shakespeare Festival. He has also directed for San Jose Repertory Theatre, TheatreWorks, California Shakespeare Festival, Idaho Shakespeare Festival, Sacramento Theatre Company and B Street Theatre. Jackson Davis * (The Poet) returns to San Jose Stage Company, where he first performed in the Bay Area nearly 30 years ago inMixed Doubles, a trio of one act plays. He returns to perform in An Iliad, a piece he first performed last year at Pacific Repertory Theatre. His other theatre credits include The Fourth Messengerat The Ashby Stage, Happy End at American Conservatory Theater, Mizlansky/Zilinsky or Schmucks at San Jose Repertory Theatre, The Best Man at Aurora Theatre Company, The God of Hell at Magic Theatre, MacBeth at The San Francisco Shakespeare Festival, Dead Man’s Cell Phone at SF Playhouse, Lovers and Executioners at Marin Theatre Company, Ben Franklin in Paris at 42nd Street, She Loves Me at Center REPertory Company and The Merry Wives of Windsor at Livermore Shakespeare Festival. He has also performed extensively with TheatreWorks in a variety of comedies, dramas, classics and musicals. Now in its 31st Season, San Jose Stage Company is recognized as the San Francisco Bay Area's Premiere Off-Broadway Theatre. The Stage is known for its devotion to new and cutting-edge work and for its commitment to showcasing high-quality local talent. Ranked the 3rd largest professional theatre in Silicon Valley by the Silicon Valley Business Journal, San Jose Stage Company is a vital force in the community. The Stage has earned a reputation for artistic excellence by providing high quality, edgy theatrical experiences that engage, educate and provoke audiences. That includes 148 productions, 45 new works and 13 world premieres.